US Sugar Corporation – High End Corporate Gift – SMARTT: Scale Models, Arts, & Technologies, inc.
Here’s a real treat that fits the classic phrase “For the man who has everything!” That’s what US Sugar Corporation had in mind when they contacted us here at SMARTT . Management was seeking a memorable corporate gift that would encapsulate fun, in a really attractive, eye-catching package, totally unique to their company? 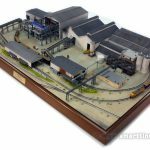 Hence this 2 ft x 3 ft Z Scale rendition of a portion their mile-long production facility was created, complete with a two trains, finished in US Sugar’s private railroad livery paint scheme. 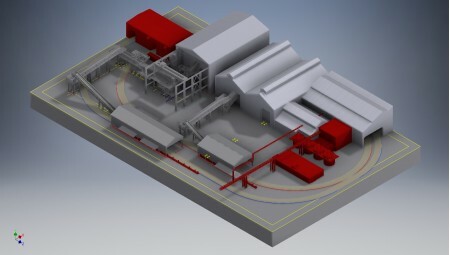 From CAD, satellite imagery, and onsite photos, SMARTT recreated this unloading and processing center in excruciating detail, using the latest in cutting-edge 3D Engineering software. From completely custom virtual representations in the computer, we created 3D printed components (a dozen large components per model). We also extensively used our tried and true laser-cut design process to make a unique gift that no-one else will have. We added a wireless remote, plug-in or cordless operation, polished wood trim, and a clear acrylic case to deliver a showroom class miniature that grabs the attention of every visitor. We wrapped it all, with an accessory kit, inside a custom printed shipping box for a complete gift package. And then we did it 22 times, each with a personalized brass name plates! A high end corporate gift to remember!